When Italian-born Laura Raimondi and her husband-to-be Steven were finalising their wedding preparations almost four years ago, there was one component which didn’t quite hit the spot – the all-important wine list! Sicilian-born Laura was not entirely satisfied with the wines on offer, so her brother’s wedding gift of half a pallet of all-organic fine Sicilian wines made the perfect gift! With many of the guests later inquiring where they could source the same wines in Scotland or even the UK, which at that point was impossible, the seeds of a new business idea were sown. In September 2016, just one year after the wedding, La Sicilyana Wines was born, with Laura soon taking countless bookings for wine parties and other events! With bookings coming in thick and fast, but the business becoming a huge drain on time, resources and emotions, Laura came across the Coca-Cola 5by20 Dundee programme, which was offering support and training to women starting their own businesses. Feeling a little isolated and in need of some direction, Laura embarked upon the week-long ‘Fast Track to Business Success’ course in August 2017. The trailblazing course, designed by Programme Director Angie Foreman, gave Laura and her colleagues the opportunity to be listened to, and to share and learn from each other while increasing their business knowledge and confidence through industry designed and led topics. Each day, they were hosted in-kind by business venues across Dundee, with interactive, practical sessions covering core business topics delivered by industry led business owners and other experts. Following one week of creative, experiential learning, Laura and her colleagues were tasked with pitching their business needs to a 10-strong support panel of business experts. With this new-found confidence, and a passion for recreating a piece of Sicily in Scone, Laura and Steven decided to take the business to a new dimension. 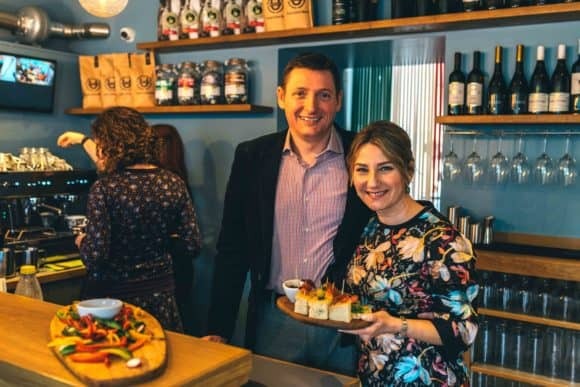 With a former bank up for sale on Perth Road, Scone, the couple took the plunge and decided to buy half of the building which they have now opened as La Sicilyana (‘the Sicilian lady’), an authentic Italian coffee lounge and wine bar. Offering everything from freshly roasted coffee and baking in the morning through to bruschetta, paninis and home-made Italian minestrone soup at lunchtime, with cheese and meat platters and Italian deserts in the evening, La Sicilyana is offering something quite unique in Scone and, indeed, in Perth. As well as the array of wines on the menu, all new and exclusive to La Sicilyana for UK wine lovers, including a vegan range, customers can buy wine to enjoy at home. A range of other Italian and Sicilian specialities will also be available for sale shortly. Accommodating up to 29 customers, Laura and Steven have brought a real sense of Sicily into La Sicilyana, with authentic Italian furnishings and traditional tiles, pottery and ceramics creating a warm, comfortable and friendly environment. Laura continued, “We are absolutely delighted to be open for business and to be bringing a little piece of my heritage to Scone. Indeed, I am very much on a mission to offer what we offer in Italy – the spirit of Sicily under one roof, with warm and friendly hospitality, family recipes, the real coffee and aperitivo Italian experience and delicious food / bite combinations. La Sicilyana is open from Tuesday to Sunday, until late (Sunday until 5pm). For more information, follow La Sicilyana on Facebook – https://www.facebook.com/sicilyanawines/ or call 07985 506 157 / 01738 552709.